These atmospheric hoods usually thin and dissipate as the thunderstorm below stops growing. It appears that the cap cloud that formed in Alabama on Saturday may have gotten some extra support from above as well. As thunderstorms grew, they ran into an unordinarily southern dip in the jet stream for July. Winds aloft at the height of these pileus clouds were likely 50 to 65 mph. Winds like this coming from the jet stream would have needed to divert around or over the growing thunderstorms. It's likely that this cap cloud grew in part due to this wind, making it also a lenticular cloud. 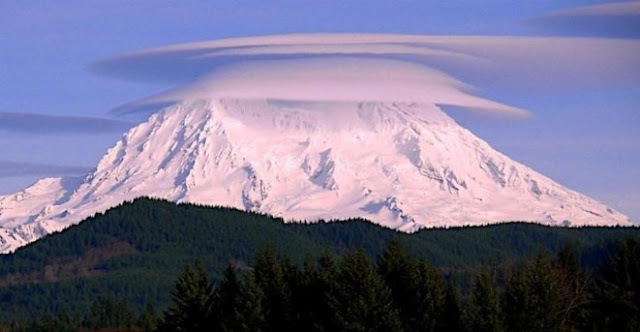 Lenticular clouds are common around mountainous areas where wind is diverted up and over or around the terrain. 0 Response to "Enormous Ice Cap Cloud Forms Over Storms in Alabama"